South Florida businesses can learn to maximize Facebook, Twitter, YouTube and LinkedIn at the upcoming Technology Forum, presented by The Boca Raton Chamber of Commerce. The “Social Media for Business” forum will show attendees how to effectively leverage their company’s social media presence, create meaningful content for marketing and maximize their lead potential. The event will be held on Thursday, January 29th at Lynn University (Henke Room – International Building), 3601 N. Military Trail, Boca Raton, FL 33431 from 8:30 to 10:30 a.m. Admission is free for both Chamber members and non-members. 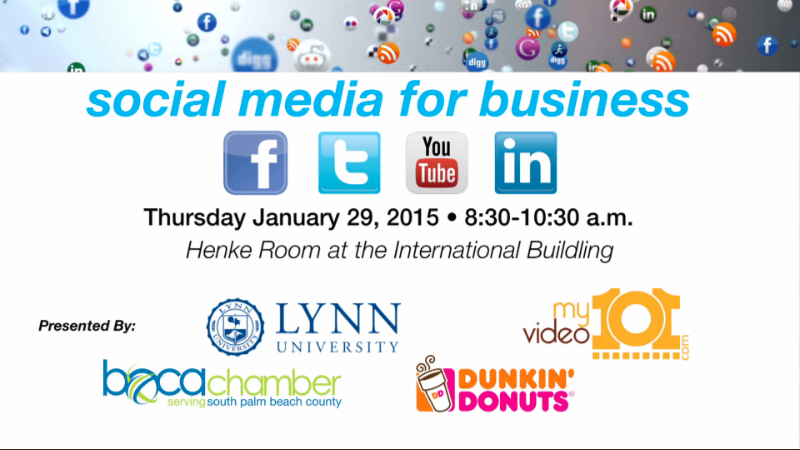 To learn more and register online, visit the Boca Chamber website. You can also contact the Chamber directly at 561-395-4433. Part of an expert panel, Jeff Klein (President of Power Play Marketing), will share LinkedIn strategies including maximizing your LinkedIn profile, why size matters (on LinkedIn) and leveraging the LinkedIn publishing platform. Other panelists include Gary Carlin (Lynn University), speaking about Twitter and Dre Baldwin (WOYG Enterprises) speaking about YouTube. Author, educator, International keynote speaker and award-winning thought leader, Jay Berkowitz, will moderate the panel and share strategies for using Facebook effectively. The panel will provide attendees with emerging strategies on Facebook, Twitter, YouTube and LinkedIn as well as the latest social tools and insights from successful social media marketing campaigns executed by leading brands.